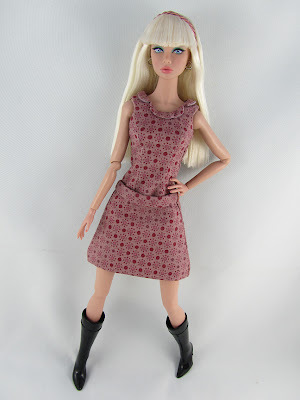 "Mod" did not enter my vocabulary until I discovered Barbie's mod cousin, Francie. I admit that I'm not fashion savvy at all. Luckily, you do learn a thing or two from collecting fashion dolls. To put it simply, 'mod' was derived from the word, "modernist" which refers to those in favor of the modern ways. The 60's played a big part in breaking out of the glam/couture/pastel colors look of the 50's to make room for a more youth oriented fashion, often involving clothes with bright colors and geometric patterns. The mod dress Nik is modelling was originally created for a Francie doll. Slightly snug on the chest for a Poppy Parker doll but I think she carries it well, overall. I love this dress for the simplicity of the design that balances out with the busy pattern on the fabric. Furthermore, you still get to enjoy the wonderful little details like her collar and belt line, even belt hoops. The matching hair piece also came with this dress. This set was sewn and designed using original patterns by A la Mode Margaud. For more doll fashion temptations, please click HERE. I really like this dress! Can we see it on Francie too? Hahaha, now that you've joined the W club MJ, beware the potato chips of your collection! Ms.Leo, just for you I will post a pic of Francie in this dress. I'm DOOMED, DOOMED, I tell you, DOOMED!!! LOL, it's a good kind of doomed!